Mexico City As a number of state governors, Congressional representatives, and Presidential candidates led by hater-in-chief, Donald Trump, along with rightwing commentators and media rags rail against the threat of Muslim refugees coming into the country and Muslim citizens in the country, it might be worth suggesting that they read Richard Reeves new book, Infamy: The Shocking Story of the Japanese American Internment in World War II. They probably would not be taken aback by the harsh judgment that history will give their remarks and advocacy as political expediency is measured against longstanding national values, but they might be somewhat humbled by the horror evoked by this sordid chapter in our history. The bottom line of the Japanese internment was a roundup and displacement that saw as many as 120,000 Japanese families displaced from their homes and relocated to ten relocation centers run by what we now know as the Defense Department and knew then as the War Department. These centers were in woebegone locations with only two in California where most of the dislocation took place, Tule Lake and Manzanar, in the far reaches of the state, and others in equally remote and godforsaken locations like Heart Mountain, Wyoming, Topaz, Utah, and Gila River, Arizona. Two of the ten were located in southern Arkansas in Rohwer and Jerome, near McGeehee. The Justice Department also operated three internment centers in Santa Fe, New Mexico, Crystal City in south Texas, and Seagoville in central Texas. The conditions were abominable by all reports, including their inadequacy in facing extreme weather conditions in these windblown, desert and mountainous areas. These were lives upended. The book is painful reading. Families forced out of their homes with little notice lost everything, often selling for pennies on the dollar, including their homes, farms, and businesses as they were uprooted. All of this without any evidence of misdeeds, sabotage, or disloyalty but driven by fear and then hate and racism triggered by the Japanese attack on Pearl Harbor. Only West Coast families were caught in the relocation but all Japanese Americans were caught in the hate. There was no happy ending even as national leaders later applauded and apologized, and Japanese American soldiers proved their worth and loyalty to the country on the battlefields of World War II. 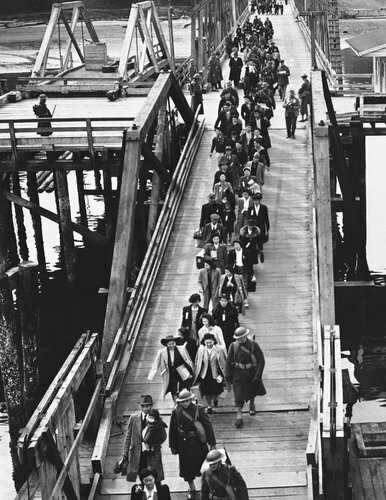 When relocated from the camps, Japanese Americans were given a bus ticket and $25. The restitution years later was less than $20,000, hardly making up for the horror and loss. The Hall of Shame and the Hall of Fame in this matter is worth political cowards and flamethrowers reckoning with closely. President Franklin Delano Roosevelt was no hero, though he came around later. General Stillwell was a hero, but General John DeWitt who ordered American Japanese to the camps has to stand out in the pantheon of American haters and fools, along with Colonel Karl Bendetsen. Secretary of War Henry Stimson opposed the evacuation but didn’t have the backbone to call the President’s hand on the issue. Carey McWilliams, famous author and director of California’s bureau of migratory labor stood tall, but Theodor Geisel, known as Dr. Seuss, and Walter Lippmann, influential national columnist, were stone cold haters and propagandists. The story of Earl Warren was the most illustrative. As California’s Attorney-General he rode his Japanese American eviction program to election as Governor on the Republican ticket, and presided over the relocations. Later, he became even more famous as Chief Justice of the United States Supreme Court. In oral history reports of his role in the internment of Japanese Americans, he literally broke down in tears at his inability to justify and rationalize his role in this horrible, unconstitutional chapter of American infamy. There are lessons galore to be learned from this horrible piece of our recent history, but the simplest one for politicians and the many ignorant of American Muslims, their countries, and their religion, is to step back, look around, and learn something first. Perhaps it is worth even opening our hearts, before we open our mouths, so that we can live with ourselves today, regardless of how history will judge us in the future. This entry was posted in Ideas and Issues and tagged Japanese Internment Camps, Muslim, World World II by Wade. Bookmark the permalink.